After the fire and the terror attacks I needed to leave London. I had to get away form people and traffic and cars and noise. I found an Airbnb near Dartmoor. I booked the cottage, I booked a train and I left for a week. Gerry was working, so I spent the first few days on my own. I was going to write, but instead I walked. There were many maps in the cottage, some were old, some were new, some were laminated. I picked a smallish, laminated one and I picked a path. Then I walked. 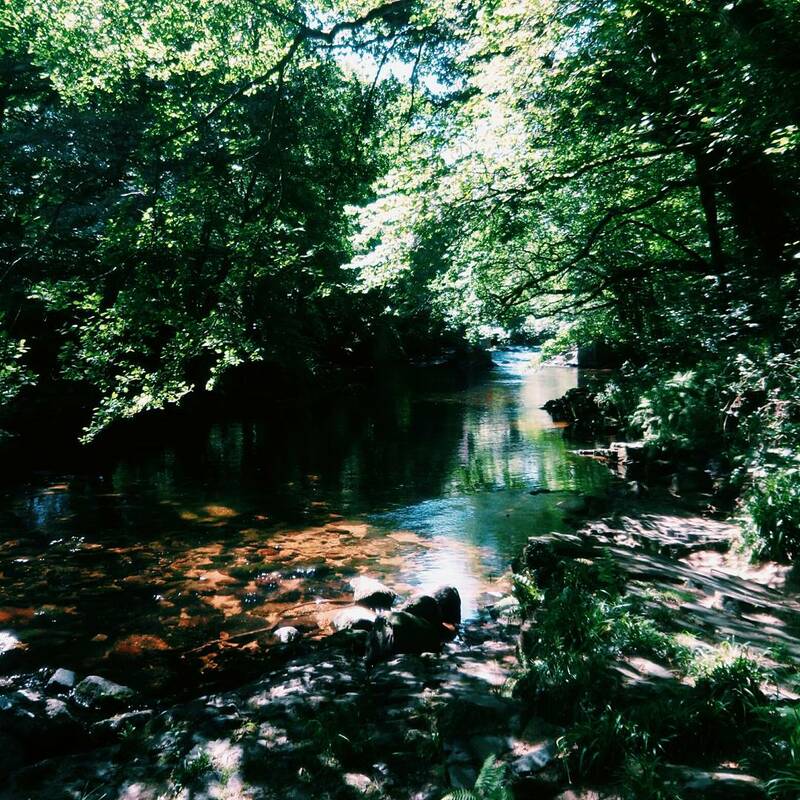 I walked through fields covered in chest-height ferns, through forests where old oak trees lined the path and the Holy Brook bubbled alongside me. 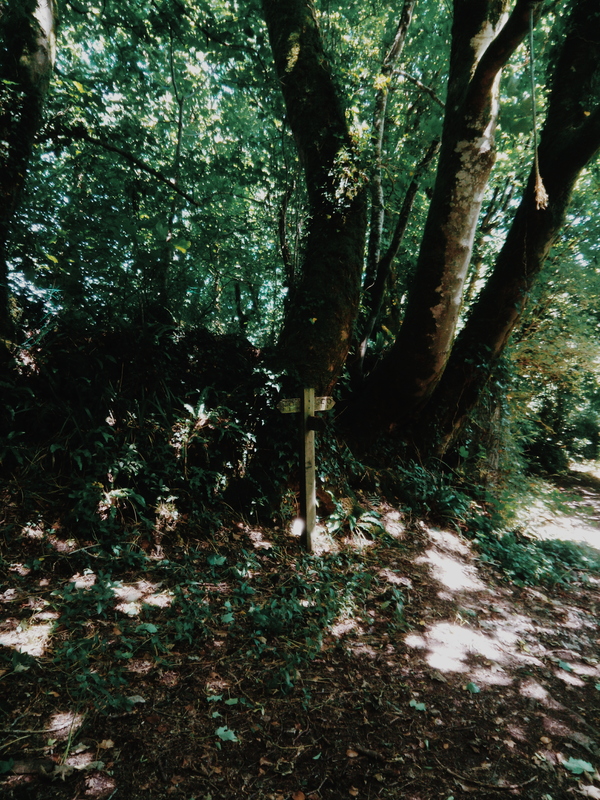 I walked on ancient bridleways and on small winding roads. I walked away from people and toward any place I could find that was green and quiet. I stopped and smelled the soil, the sunshine on the leaves, the growth and the decay. I sat on an old drystone wall, a bridlepath behind me, the ground falling away from me on the other side. There was a small brook in the valley below and I wanted to spend some time near it. The trees were heavy and green above. My phone and the map were resting on the wall next to me. Out of nowhere a happy spaniel appeared, jumped up on the wall and pushed the phone over the edge. I patted the dog, then scrambled down the stone wall, down the slope and crawled underneath a fallen tree covered in ivy to retrieve my phone. It’s still not working properly. I take that as a sign. Slow down. Gerry joined me for the last few days and we walked some more. 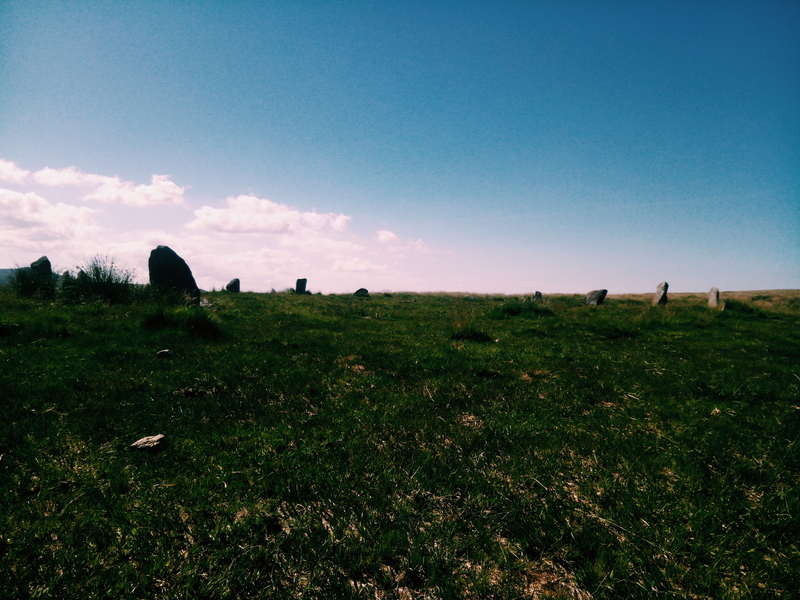 We walked to the most famous Tors on Dartmoor, we hiked to an old stone circle and had lunch among the standing stones. I’m back in London now. I’ve been back for a couple of weeks, but the paths I walked stayed with me. They were made by feet and hooves over many centuries, perhaps over many millennia, and they can be walked still. That’s what keeps me loving this country. It’s old, its paths are old and there are many left to explore. I’ve been meaning to visit the London Stone for a bit over a year. This weekend I decided the time had come. On a Sunday the streets are quiet, the buses glide through normally congested areas and the financial district, where the stone can be found, is silent and empty. Heavy clouds hung over London, the pavements had a glossy varnish of early morning rain. I took the bus south and looked up the stone on Wikipedia. No one seems to know exactly what its purpose was or how old it is. It was first written about in the 1550s and even then people seemed to think it was old. Some have speculated this was the stone King Arthur pulled Excalibur out of, as if he was a real king and Excalibur a real sword. Others think it might be an index stone, pointing to a stone circle that once stood on the site of St Paul’s Cathedral. My favourite theory is that it’s a sacred terminus stone dedicated to Jupiter. Supposedly these stones were placed in the centre of any Roman city. London started out as Londinium after all, a small outpost of the Roman empire. The bus took me past dark and slumbering office buildings. Through the windows I sometimes spotted security guards reading morning papers or chatting to cleaners. The cafés and restaurants were quiet and ghostly, their purpose lost on a day when there are no customers and no bright lights. The streets were empty, except for a few packs of tourists in brightly coloured rain jackets. I got off near Bank and took Walbrook Street south toward Cannon Street. I realised, as you do sometimes in this city, that I had never walked down this street before. In every area, even the ones you know well, there are always new places to explore. London unfurls and stretches out like a coastline, there are labyrinths to explore. How many miles would these London streets add up to? I tried to Google it, but couldn’t find an answer. I couldn’t remember having walked down Cannon Street before and stopped for a moment, finding my bearings. Then I set off east, looking for 111 Cannon Street, where the stone sits today (it’s been moved a couple of times). Even though I knew it’s now placed within the foundation of a WHSmith I still managed to walk past it and had to turn around at 119 Cannon Street. The stone itself is pretty underwhelming, hidden behind metal bars and glass so murky and dark it’s almost impossible to make out what’s behind it. I tried to muster up some feelings of respect on solemnity. This was the London Stone after all, the stone that’s been mentioned by different writers and historians over the last 500 years. 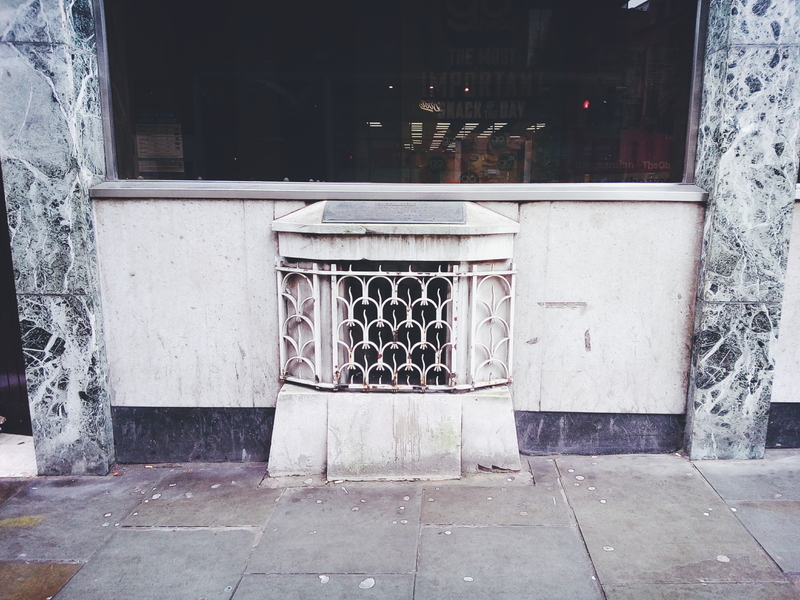 It’s the mystery foundation stone that might make London crumble and fall if removed. I felt slightly self-conscious. This was clearly a forgotten and unloved landmark. I couldn’t imagine many tourists stopping at this spot or the commuters heading to their offices in the city on a weekday paying it much attention. Feeling underwhelmed I moved on. 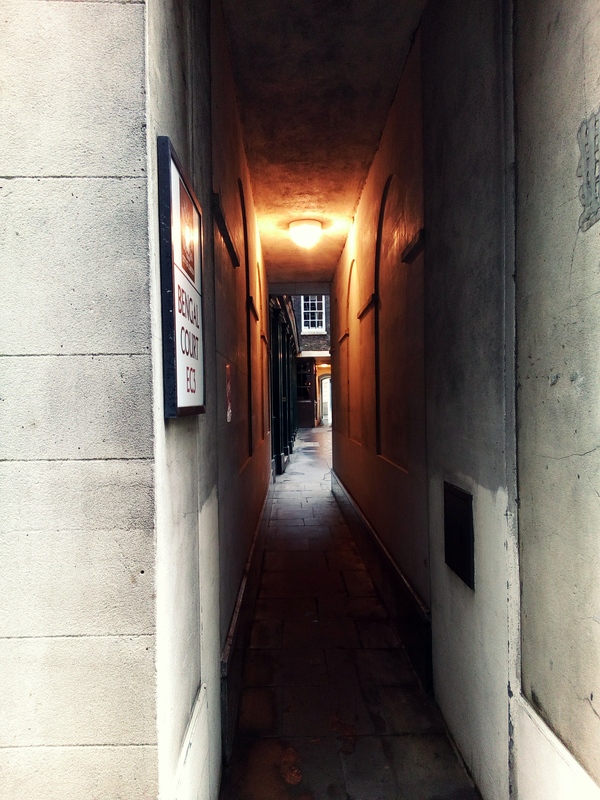 I spent the morning exploring the alleys in and around Bank. This is one of the oldest parts of the city. The streets feel heavy, the buildings loom large and tall. They even smell heavy, of dust and stone. Between them runs a maze of alleys where unexpected smaller buildings, restaurants or offices, are crammed between giants. Two street sweepers were taking break in one of the alleys. Some tourists hurried past on the roads outside. In between the buildings I was mostly on my own. I passed the Jamaica Wine Bar on St Michael’s Alley and spotted a church. The choir was practicing for the morning’s service and I snook in and listened for a while. As a few people arrived for the service I made my way out, feeling like an intruder. I continued on, got lost around Aldgate, the sun broke through the clouds, I walked in vain looking for an open coffee shop. Eventually my homing instinct took me to Spitalfields, where there is always coffee. I sat down and read and wrote for a while, making a promise to myself that I’ll spend more Sunday mornings roaming around the city.